All signs continue to show heavy rains for all portions of ENC early Monday morning through late Monday evening. Energy associated with Alberto will approach the area late Sunday night and into the early morning hours for ENC. This will push northward throughout the day which will be one of the focal points with regard to precipitation intensity. Note: Subtropical Storm Alberto will not make landfall along the east coast. 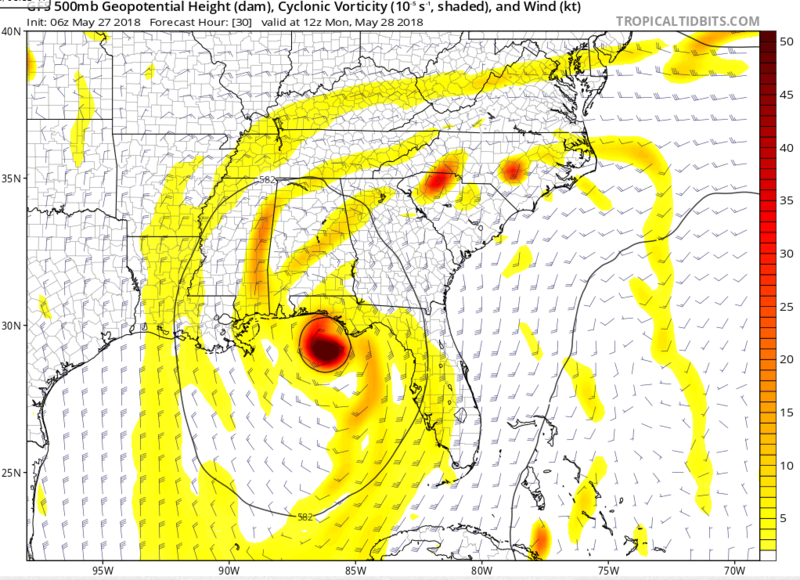 500mb forecast shows energy associated with Alberto passing through NC Monday morning. Vertical velocities and upper-level divergence will be elevated as deep tropical moisture is filtered into ENC. With forecast soundings showing PW around 2.26″ everything will be in place for heavy rainfall. Forecast 850mb vertical velocities indicating areas of greatest lift during the event. 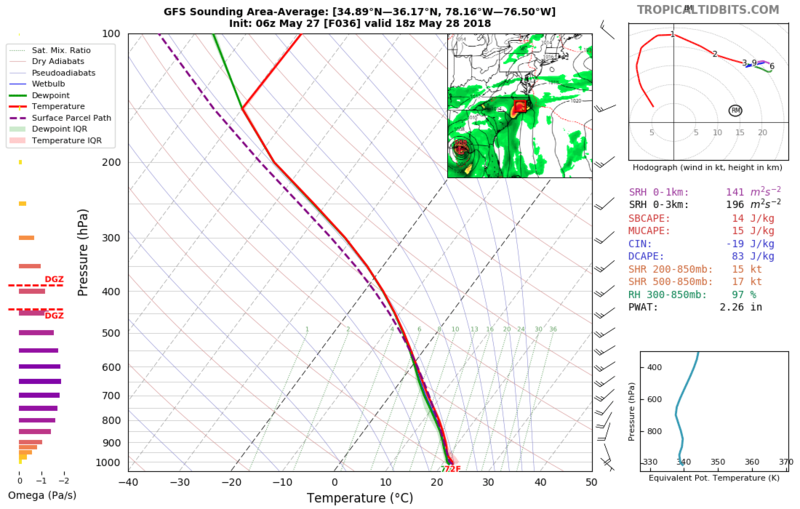 Forecast soundings indicate PW values around 2.26″. Flash flooding is expected with heavy rainfall over already saturated soil will lead to rapid runoff could produce flash flooding in urban, low lying, and poor drainage areas. The excessive rainfall outlook has most of North Carolina in the slight risk category meaning there is a 10%-20% risk of flash flooding within 25 miles of a point. Excessive rainfall outlook for Monday through early Tuesday morning. Forecast totals from WPC show rainfall totals in excess of 2.00″ over most of ENC with highest totals across the southern half of 3.00″-4.00″. I wouldn’t be surprised if some areas reach 5.00″. The NWS has issued a Flash Flood Watch for the southern 2/3rd of ENC. 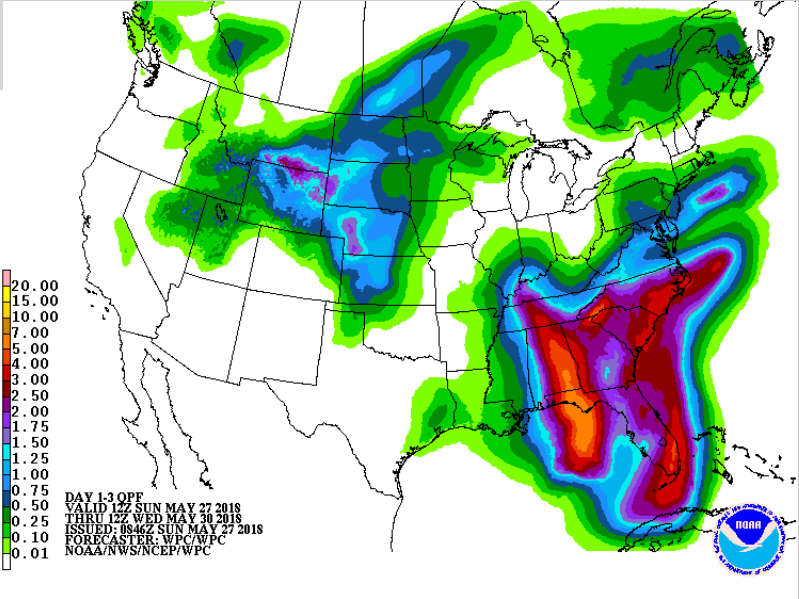 Forecast rainfall totals day 1-3 from the WPC. It is recommended that you monitor the weather for your area and do not attempt to drive through flooded roads. Update on Subtropical Storm Alberto: Alberto has attained with speeds of 50 mph based on the most recent advisory and minimum central pressure of 994 mb. There is still dry air that Alberto is fighting which has left the center bare for quite some time. Yesterday we saw all of the convection on the eastern side of the storm with the western and southern portions remained bare which was due to an upper level trough that generated enough shear to prevent a transition from subtropical to tropical. Now that the shear is weakening, the convection is beginning to develop on the western side and closer to the low-level circulation. Alberto still needs to fight off dry air that has been wrapped into the storm to the east. If it is able to fight off the dry air, conditions could be favorable for a transition from subtropical to tropical. However, it does not appear that we will see rapid strengthening prior to landfall but could still be a strong tropical storm prior to landfall. Whether it makes landfall as a subtropical storm or a tropical storm, the impacts will be the same. As I mentioned previously, there will be two different swaths of heavy rain as an impact from this storm. One of those will make landfall around the Florida Panhandle and the second that will stretch from Florida to Eastern North Carolina (which I described above). Update (Sunday night): It has become apparent that Alberto will not obtain tropical characteristics prior to its landfall. NHC issued the statement in its most recent update which isn’t entirely surprising given its satellite presentation over the past couple of hours. This storm’s intensity has not changed however with maximum sustained winds still clocking in at 65 mph and minimum central pressure of 991mb. The flooding impacts still remain for the southeastern states including ENC for the next couple of days. I will keep updating on this storm and its impacts on ENC.